At Koch Kuts, we provide outstanding landscaping services throughout Burlington, WI, Mukwonago, WI, and the nearby areas. Our experienced and professional team of landscapers will deliver the very best results for your residential or commercial property. By using advanced techniques such as core aeration, we are able to keep your lawn looking its best all throughout the year. Aeration of your turf surfaces is the natural process of air exchange between the soil and the air. We can help this process by mechanically removing plugs of thatch and soil from the lawn. Core aeration reduces soil compaction; creating a channel through which oxygen, water, and nutrients can penetrate the soil and promote healthy growth. Gradually, the soil becomes compacted over time and this leaves it undesirable for adequate and healthy lawn growth. Many activities which occur on the soil such as playing, walking, mowing, and watering cause the particles to become compacted and reduces the air space that is needed for sufficient root growth. This occurs mostly in the upper 1 to 1 1/2 inches of soil and needs to be rectified with mechanical aeration. Mechanical aeration plugs can range up to 3/4 inch in diameter and penetrate the soil up to 4 inches deep, approximately the size of a finger. This process improves the circulation and allows enough air, water, and nutrients to reach the roots. The result is a lawn that is healthier, denser, and more heat and drought tolerant. Grass in compacted soil lacks vigor, grows very slowly or does not grow at all and becomes very thin. Know your grass and know your soil for optimal results; clay soil needs more frequent aeration than a looser soil. 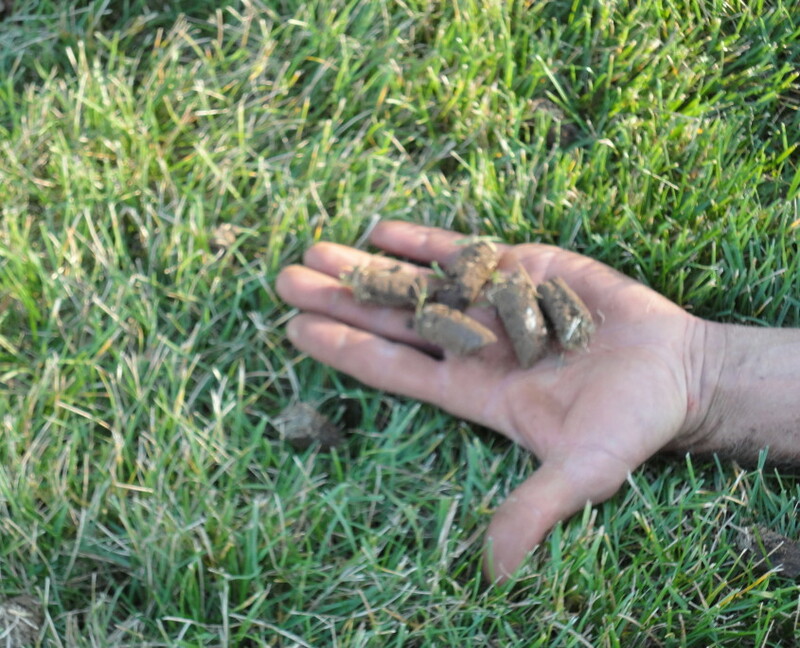 Core aeration removes small plugs from the soil and deposits them on the surface of the grass. These will break apart and disappear in a couple of weeks. Cooler weather is the most ideal environment for aeration, so early spring and fall during the growing season is the best time of year. This process improves the depth and extent of the grass root system. The holes will fill in with white activly growing roots. After aerating, it’s important to continue basic lawn care practices such as proper fertilizing, mowing, and watering. Koch Kuts Landscaping & Maintenance offers premier landscaping services for all of your core aeration needs. Our experienced landscaping staff delivers exceptional core aeration services for your residential or commercial property. We can provide you with a free quote so you can get the quality landscaping services you need.